» Archived Review: LOUIS TRIMBLE – Fit to Kill. Archived Review: LOUIS TRIMBLE – Fit to Kill. 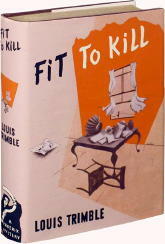 LOUIS TRIMBLE – Fit to Kill. Phoenix Press, hardcover, 1941. Trimble’s first book, or at least his first mystery — it’s possible that in his early days he started as a western writer — and the first appearance of dilettante detective Gerry Storm. And unless Al Hubin messed up, it seems to have been his only case worth mentioning. It’s the only book’s he’s appeared in. The book starts well, and ends well. The middle is not worth reading. I haven’t gotten around to writing my own first detective novel yet, but I’m convinced that that’s where the biggest hurdle lies. How do you make the process of investigating a murder interesting: finding clues, interrogating suspects, provide a little action and lively banter between the main characters, and keep the reader interested, all at the same time? This one lets us down on almost all of the above, but on the plus side, what Fit to Kill is, I am happy to say, is a locked room mystery. While there is a small gap in a partially opened window as a means for a murderer to have committed the crime, the flower box in the window has not been disturbed. More: the dead man was not shot or poisoned, but done in with the inevitable blunt instrument, more than 10 feet away from the window, and no sign of the weapon. The dead man, by the way, was a truly obnoxious creature — hence the title — and there is no dearth of suspects. Storm follows in the well-worn footsteps of Philo Vance and the early copy-cattish Ellery Queen. Nothing I’ve said, however, is enough for me to give this book more than a lukewarm recommendation. By 1941 maybe the Vancian charm was gone, or maybe Trimble was no S. S. Van Dine. [UPDATE] 09-13-12. Toward the end of his career, Trimble seemed to de-emphasize mysteries in favor of either science fiction and westerns. According to Al Hubin, though, he wrote nearly thirty mystery novels between 1941 and 1970, including several as by Stuart Brock and Gerry Travis. The vast majority of these were written for Phoenix Press or Mystery House, both lending-library publishers of no great distinction, or as paperback originals for Ace, including quite a few Ace Doubles. By the 1950s, Trimble’s mystery fiction had become much more hard-boiled in nature; based on the ones I’ve read, which in truth are not many, he was never a terrible writer, but he certainly never made it to the big time, either. Other than the fact that I wrote this review, I don’t remember Fit to Kill at all. You now know as much about it as I do. I discovered two copies for sale just now on abebooks.com. The cover of the one seen above is a facsimile, but it’s the cheaper of the two, with an asking price of $175. It’s a private eye novel that I described as being in the “deep pure pulp tradition,” and I had quite a bit of fun with it. Just updated my website article with links to your two MYSTERY*FILE reviews. Over the past year, have been slowly adding links to MYSTERY*FILE from my site. These MYSTERY*FILE articles are rich in information, and a real resource. Thanks for the compliments, Mike. But if truth be known, and I’m saying it, the range and depth of your website is beyond comparison. One could start anywhere there and be lost for days. For some reason Don Wollheim, head of DAW Books, published a lot of Trimble’s books, starting when Wollheim was at Ace and bringing him over to DAW when that line started up. While I’ve never read BODELIAN WAY, I know Trimble wrote a lot of lightweight space opera, which was popular back then but doesn’t get published much any more. This may be a good thing, but I miss it. I have three ACE-doubles with a Trimble crime novel and one Lion Book: Blondes Are Skin Deep. A typical Lion title. Gary Lovisi begins his essay on Lion Books in “The Big Book of Noir” with a quote from this Trimble novel. I have not yet read any of them. But I should give the Lion Book a try. Louis was a personal friend. He told me he started writing with thirty mystery novels, got bored with the genre and switched to westerns (he moved from San Francisco to a ranch in Idaho), got bored with westerns, and moved on to science fiction. Then his academic career took off (he was a noted linguist) and he switched to writing linguistics articles. I’ve published an anecdote about his best-received novel (The City Machine) at the link provided above. Thanks for the link and the interesting story. I never realized that Louis was a noted linguist, only the SF, mystery and western writer. Lots of books came out of his typewriter!